Lunch at Hong Kong Wine Vault catered by the Press Room. 2010 Jean-Marc Boillot Puligny-Montrachet - oaky, toasty, lemon citrus on the nose. Nice acidity on the palate. 1973 Chave Hermitage Rouge - violet and floral nose, with farmy and bacon fat notes. Very lovely and drinking well. 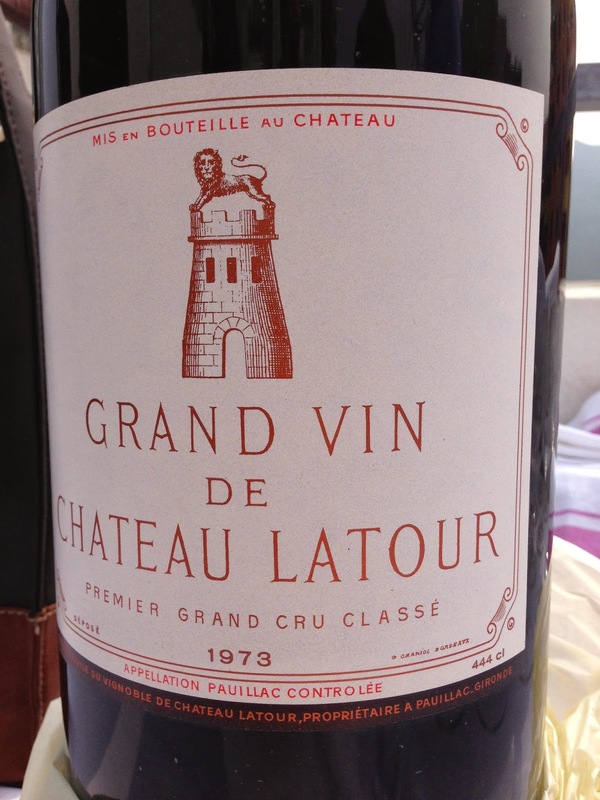 1973 Latour en jeroboam - what a beautiful wine! Minty, smoky, earthy, tea leaves, dried herbs... Very fresh and vibrant. Smooth on the palate but by no means light and diluted. A little acidity on the back palate. Wow! This is meant to be ex-château stock from an auction house, and it really shows! 1992 Château de la Maltroye Chassagne-Montrachet 1er Cru Grandes Ruchottes - mature, caramelized nose, sweet with Chinese licorice notes. 1973 Tortochot Chambertin - nice and sweet fruit, acidity a little high, a little savory. Long and spicy finish. 1998 Bouchard La Romanée - minty, a little potpourri, perhaps fermented without de-stemming? Good power here, but needs more time. 1998 Jean-Jacques Confuron Romanée-St-Vivant - fresh, fruity, pine needle notes. Lovely and open. Much more ready than the La Romanée. 1975 Ducru-Beaucaillou - sweet, grassy, smoky. Pretty open. 1963 Averys Romanee St. Vivant - nose of leather, animal and sweet fruit. 1971 Maison Leroy Echezeaux - a little savory with a little fruit. Not open yet and gone too quickly. My contribution. 1994 Rayas en magnum - fruity, sweet, cool fruit, pine needle, potpouri, a little ripe. Drinking very nicely. Macallan 18 Years, distilled in 1973 - really beautiful and nutty. The old style of Macallan. 1998 Yquem en demi-bouteille - polyurethane, honey, apricot and nutty. 1981 Rayas - leather and animal notes. Very nice. 1987 Guigal La Turque - so much bacon fat, sweet and round. Drinking beautifully. Awesome. 1990 Vogüé Chambolle-Musigny 1er Cru Les Amoureuses en demi-bouteille - a little tight, not great. sharp alcohol with shiitake mushroom notes. A pity that this was drunk just after opening, without proper aeration. My contribution. 1996 Domaine Leroy Romanée-St.-Vivant - forest, sweet fruit, beautiful, nice with dried herbs. Pretty rich and powerful. 1997 Gaja Barbaresco Sori San Lorenzo - smoky, nice concentration, drinkable now and very nice on palate.